I know I’m a day early, but I have a busy week ahead. I couldn’t miss out on this Blogfest hosted by Mithril Wisdom and Geek Banter. No one would mistake me for a gamer. You may find me occasionally playing a game of Spider Solitaire while standing in line. I have been know to giggle with glee at destroying pig shaped storm troopers on the Star Wars version of Angry Birds (blame that on on my 12 year old nephew). But, the last time I was obsessed with a game was back in elementary school. 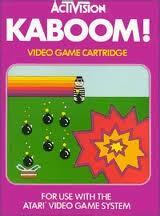 We had an Atari 2600 game system and I spent ours becoming a Kaboom! master. Now, I have seen this game recreated as an app, but nothing compares to playing this game on an the Atari with these special controls. All you had to do was prevent the bombs dropped by the bandit from hitting the ground. The more you caught, the quicker the bandit dropped them. At a certain level, the bombs would drop so fast, you went insane (literally, not virtually) trying to catch them all. For some reason, I was really good at this game. Check out my favorite game, Kaboom! Thanks for entering the blogfest! Thanks for hosting an interesting blogfest. I love to touch on things I hadn’t though about in years. It kind of dates us, but was the first game console I can remember. I remember when my dad bought us the Atari. It was so cool back in the day. Thanks Sandy. I am always playing spider solitaire. 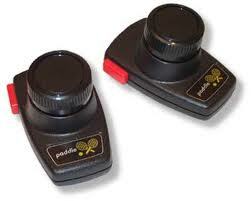 I remember Atari – pong…do you know you can now get joy sticks to plug into your t.v. for those games? We have some…pong, that brick thingy, pacman…it’s nothing like the games they have out now, but these are classics! They are classics. I might get back into video games if I could play these games again. Maybe! haha. I absolutely agree that the new apps just can’t recreate the feeling of those original Atari games – great choice! I actually bought a version of it and was so disappointed. I know. You never really got any where and unless I was a robot, there is no way you could beat the game. Thanks for hosting a great blogfest. Atari was so revolutionary in its day. I loved Moon Patrol and Ms. Pacman, myself. Atari had some sweet games back in the day. I still have a bunch of Atari and NES games on a hacked Xbox. I still love to play River Raid! I loved playing games on the Atari when I was a kid. Looking back the graphics and everything seem so dated and yet my memories of those times are so precious and I wouldn’t trade them for the world. I need to look into how I can play the games now. There was also a game called Pitfall, which was great.